After countless doors knocked, donations tallied, texts sent, and vote after vote sought, pledged and returned, and so many races yet to be called, there’s only one thing left for the board of directors to say to you, the Riveters Collective. Thank you for your time, your efforts, your voices, and your bravery. Thank you to every person who ran for office—who braved campaigning and forums, who earnestly listened to a cacophony of differing opinions, and made the choice to offer your leadership to our community. No matter the outcome of your race, thank you for your willingness to serve. Thank you to all who served on our endorsement committee and gave hours of your time vetting candidates, not to determine who was the most enigmatic choice, but to determine the candidates you believed most capable of accomplishing the goals of the Riveters’ platform. Thank you to everyone who showed up to a candidate forum and asked tough questions. Thank you to everyone who wrote a letter to the editor, attended a rally or a protest, joined a new group, donated to a campaign or cause you believed in, or simply engaged in the type of political conversation you would have shied away from 3 years ago. Thank you to everyone who sat still and listened. Who paused to examine their own privilege, had uncomfortable conversations, and read and learned and discussed new views on intersections and identity. Thank you to everyone who knocked on doors and made calls and sent mail (both e- and snail) to their fellow voters and our elected representatives. Thank you for holding our government officials accountable. Thank you for helping to crush turnout records. And thank you for inspiring so many others to join in our work. 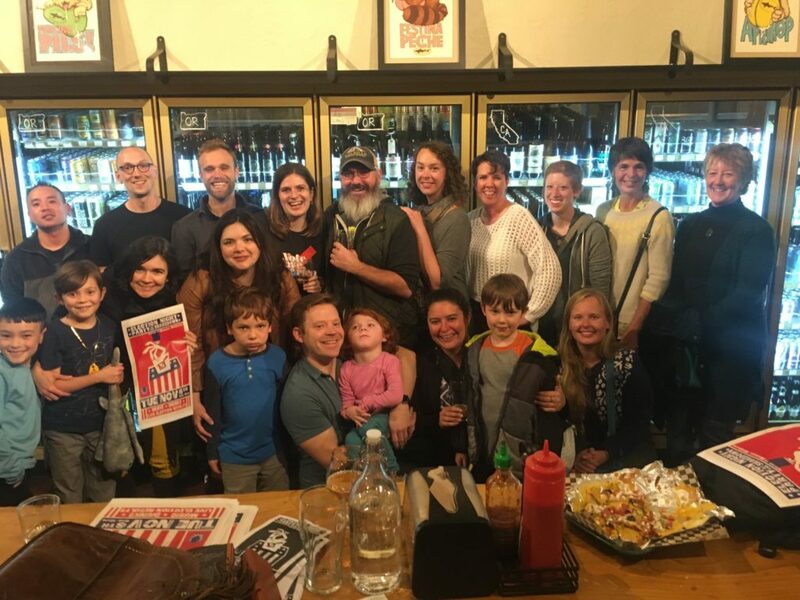 Two years ago, in the wake of an election that shattered so many of us, the seeds of a movement were planted in our ever-fertile Northwest corner of Washington. Riveters was born out of moxie and collaboration, when a group of ordinary people—women, parents, perfectly average individuals—stopped waiting for those in power to fix things. Although so many of our members would still consider themselves unremarkable, together we’ve accomplished the exceptional, simply through our commitment to doing the work at hand—work that too many of us have neglected for too long. It’s work we’ve not done perfectly, with plenty of missteps and painful lessons learned. There have been times when we’ve been blind to our privilege and had our edges painfully stretched. We’ve experienced a taste of the personal attacks that too often are directed at any woman in the public sphere. We’ve learned, we’ve grown, and we’ve persisted. In these election results there are wins and not-wins, and lots of continued nail-biting and challenges to act upon. But what we’re building is not an event or a single election, it’s a habit. It’s an acceptance of our responsibility to one another and the world we live in. We’re reclaiming our space in civic life. At our election celebration, board member Marissa McGrath quoted Henry Rollins and said “The only thing worse than complacency is complacency.” With all that you’ve made happen these last weeks, months and years, we know that as a community and group, we’ll never be complacent again. So today we celebrate our wins and grieve our losses, and then we get back to the practice of civics. There’s a platform to revise, a candidate bench to build, and so much more to do to nurture our community and democracy. However, one thing is abundantly clear: however much work there is to do, we ARE doing it. These are our recommendations for Whatcom County voters in the 2018 general election. Want more information on ALL candidates? We’re updating this (linked) document with everything we find! How did we decide who to endorse? We thought you’d never ask! Click through for more information. Let’s Flip the 42nd in 2018! The Riveters Collective is doing it! We have ONE goal for the 2018 campaign season: FLIP THE 42nd DISTRICT by increasing voter turnout with a proven strategy. We will go door to door to ask low turnout voters to pledge to vote. They fill out a postcard promising to vote, we mail it back to them so it arrives with their ballot. 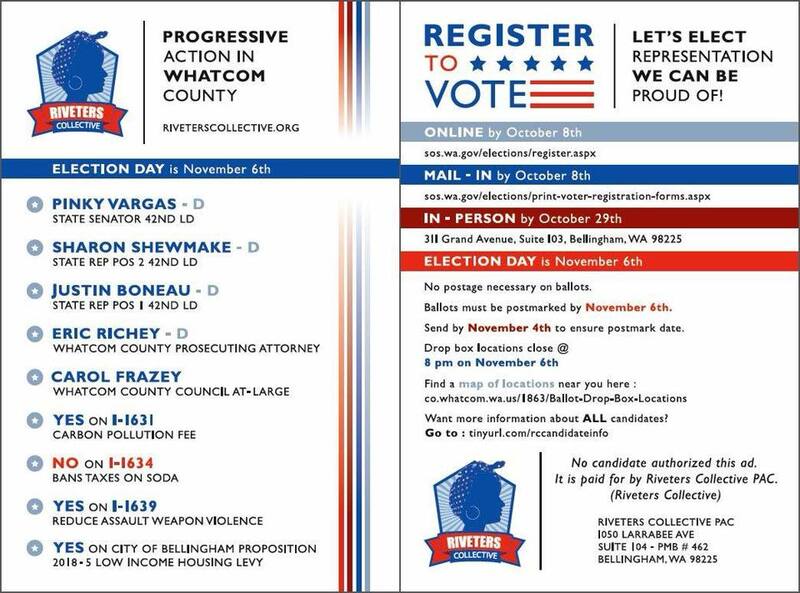 The front of the postcard recommends voting for RC-endorsed candidates (Pinky Vargas, Sharon Shewmake, Justin Boneau, Eric Richey and Carol Frazey), initiatives (Yes On 1631, No on I-1634, and Yes on 1639) and the Bellingham Home Fund. 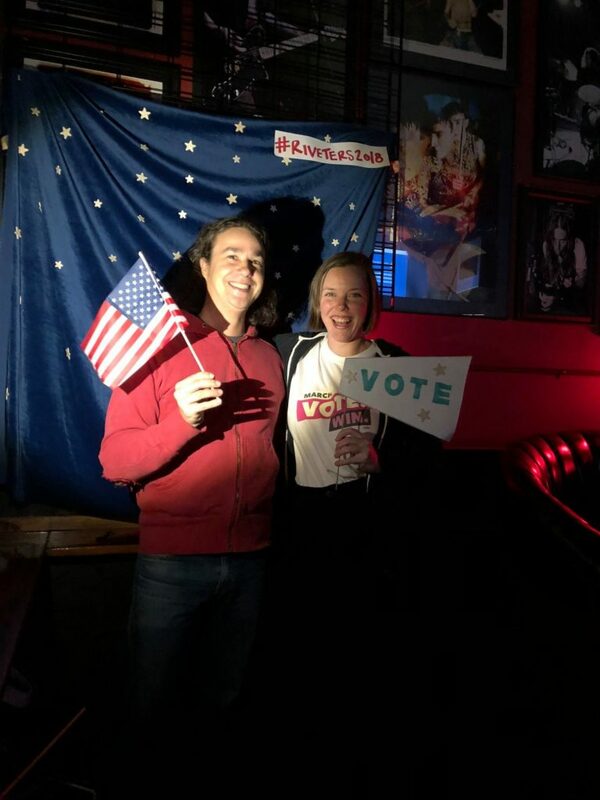 Research has shown that pledge to vote campaigns are more effective than traditional get out the vote strategies, and no other local campaign is targeting infrequent voters. Our goal is to turn out 2,000-3,000 votes that would not have otherwise been cast. Our postcard will include our voting recommendations so that these votes go to our candidates. 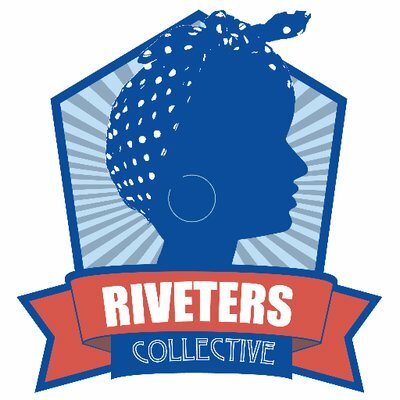 Riveters Collective is the only organization doing this work in the 42nd. These are votes that otherwise wouldn’t show up in this election and they could be the difference between winning or having Doug Ericksen (and Vincent Buys and Luanne Van Werven) back in Olympia. This will bring the turnout we need to win. We expect to spend $21k on printing, postage and staffing for this effort. Want to volunteer? Send us an email at riveterscollective@gmail.com, we’ll be in touch in September. Thanks to Becky Kurle at Liet Unlimited for design work. We now have tens of thousands of these beauties on hand. 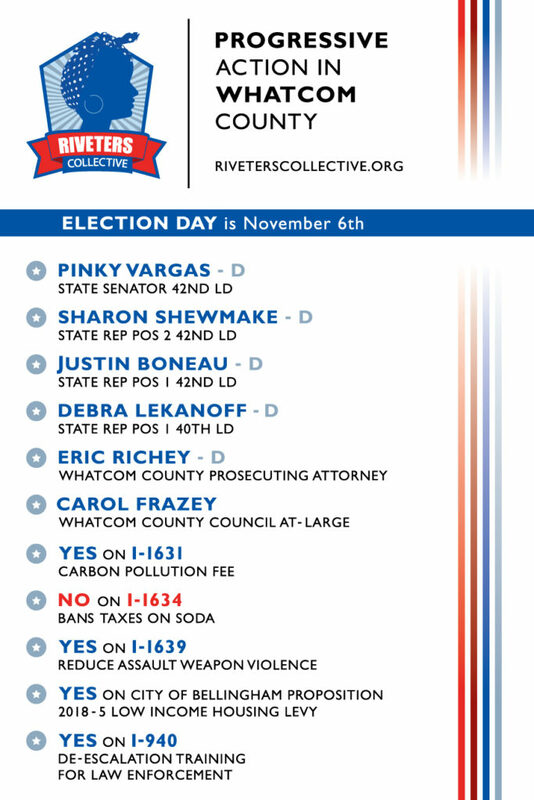 Riveters Collective has Washington Nonprofit Corporation status, which allows electoral activity, including endorsements. RC Member Jae Heidenreich volunteered to be the Endorsements Committee Chair. RC recruited endorsement committee members by an open call to members through Facebook and email. RC excluded anyone from the committee who had already begun working on a campaign, is a candidate for a local office, or has a formal leadership role in a major political party. For this reason, RC board members Lisa McShane and Stephen Jackson were excluded from the Endorsement Committee, and abstained from involvement in the process. Michael Peñuelas began working on Tim Ballew’s campaign halfway through the endorsement process and excluded himself from participating in the 42nd district senate race endorsement work. Elizabeth Hartsoch and Eowyn Savela supported the committee’s work, but did not serve on the committee. Elizabeth actively worked on the campaigns of Tim Ballew and Carol Frazey, and excluded herself from assisting the committee’s work on the 42nd district senate race and the county council race. Eleven people responded to the call, met the criteria, completed the application and were appointed to the endorsement committee. Three of the eleven committee members, also serve on the RC board: Lisa Van Doren, Michael Peñuelas, and Towhee Wean. The other committee members were: Jae Heidenreich, Arlene Feld, Julie Batten (who had to resign from the committee early for personal reasons), Debbi Anderson-Frey, Galen Herz, Amy Rydel, Mehar Singh, and Maggie Davis-Bower. Endorsement committee members formed sub-groups to work on the six different positions. 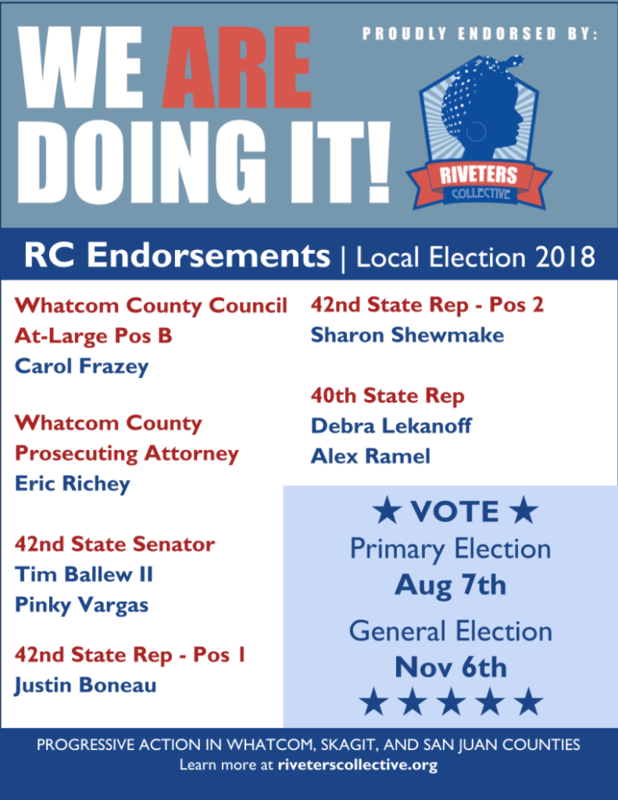 Recognizing that the RC leadership team and endorsement committee are not sufficiently representative of the larger community–and more importantly the more marginalized and vulnerable members of the community–and recognizing that many local progressive groups are prohibited from making candidate endorsements, RC solicited feedback from groups representing diverse interests. We received and incorporated input from Recreation Northwest, Susan Marks, Whatcom Peace & Justice Center, the Lummi Nation, Racial Justice Coalition, Gender Diversity, Bellingham Tenants Union, and NAMI Whatcom. The Endorsement Committee built questionnaires based on responses from community groups and RC’s platform. 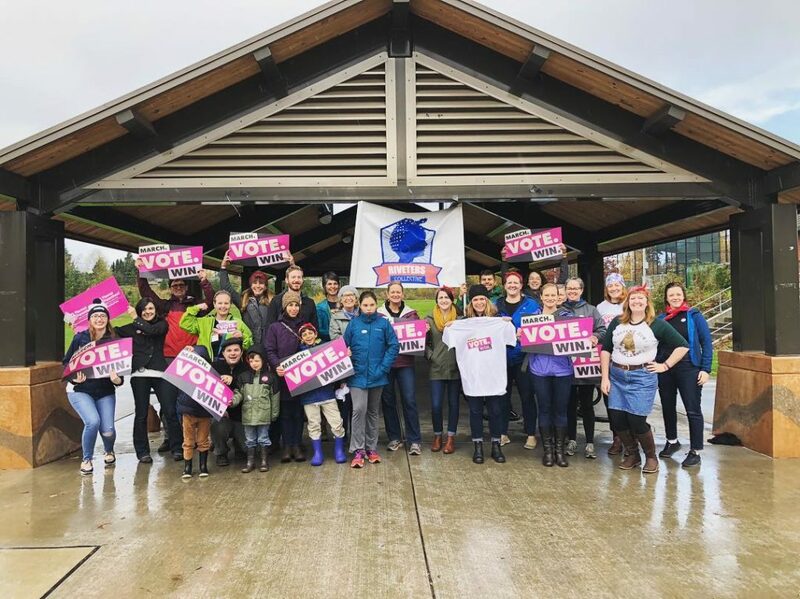 All progressive candidates who filed to run for 40th district representative, 42nd district representative, 42nd district senator, and Whatcom County prosecutor. All candidates who filed to run for Whatcom County council (except Eric Bostrom, due to his hateful and discriminatory public statements and actions). Final questionnaires were shared on the RC website and in the facebook group. Declared candidates were sent RC endorsement questionnaires on May 10th and others were sent at the end of filing week. Questionnaires were due May 25th. The endorsement committee developed a rubric to rate how well each candidate’s questionnaire responses aligned with the RC platform. The endorsement committee developed candidate interview questions and rubrics. Eleven candidates submitted materials to the endorsement committee by the May 25th deadline. The endorsement committee interviewed candidates June 4-7. The interviews were recorded on video and will be made available to the public, along with the questionnaire responses. Each endorsement committee member scored candidate written and interview responses. Following extensive conversation, the endorsement committee recommended endorsements to the RC Board on June 10th. The RC Board used the recommendation of the endorsement committee to vote on the final endorsements. We have a cheat sheet for you! Click on the image below to download a shareable image for social media. Want to know a little more about these candidates and why we chose them? Click here to read their questionnaire responses, along with the responses of several other candidates whom we interviewed. Click here to view our candidate info sheet for all local candidates. Click here to view a summary of the endorsement committee’s impression of each candidate who sought our endorsement. Our endorsement process is underway! This is one of the main ways that our collective shows solidarity with a specific candidate or issue. In other words, an endorsement is our way of saying “Hey, we like your vision for our community, we want to align ourselves with the actions you will take to achieve that vision, and we respect the way you conduct yourself as a candidate.” If you haven’t checked out the questionnaires – find them on our site! Engages in clearly unethical, illegal, or manipulative behavior. We believe in a political environment and community where people are respectful of one another. We believe in a political environment and community where people are free to be themselves without fear of harm. We will work for a future that reflects those values. We will stand with candidates who believe in that same future. We are doing it! Click through to view our 2018 endorsement questionnaires. Many thanks to the hard work of our all-volunteer endorsement committee!